I’m so thrilled to say that I have completed my appliqué and hand quilting project! This project surprised me. I expected needle turn appliqué to be really challenging and hand quilting to be more straightforward. It was just the opposite! I thought the needle turn was very doable and Sarah Fielke‘s method (from her Craftsy class) worked great for me. The hand quilting was harder. I used Sarah’s mini-tutorial but I just couldn’t get it. I probably gave up on doing it right too quickly… I ended up just putting the needle all the way through and then bringing it back up. It looks fantastic on the front but the back is a little bit of a mess! A charming mess. 🙂 I sometimes let myself do things incorrectly at first and then try to refine my method as I go. In this case it doesn’t matter because it will be a wall hanging. But if I ever want to do a bed or throw quilt (and I do!) then I’ll have to try harder to do it correctly because how it looks on the back will matter more. By the way, I will never complain about threading a needle with normal thread again after threading my needle with that danged pearl cotton so many times! That was a pain. I really miss my sewing machine! I spent the better part of the last 2 weeks on this project and my thumb is sore from grasping a needle. I can’t wait to get some good machine sewing in next week. 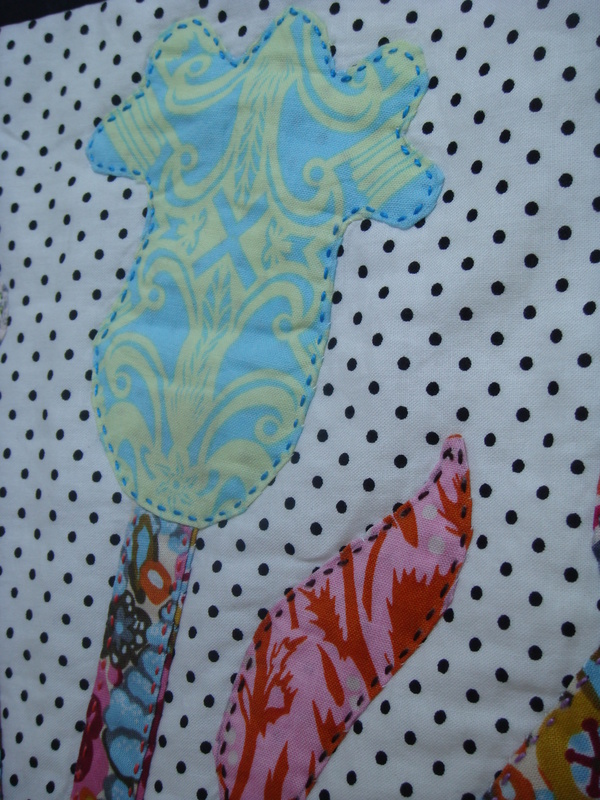 That said, I love how this looks and I definitely will be doing more appliqué and hand quilting in the future. Thanks for visiting! Come back Monday to hear about a new project I’m developing using men’s shirts! 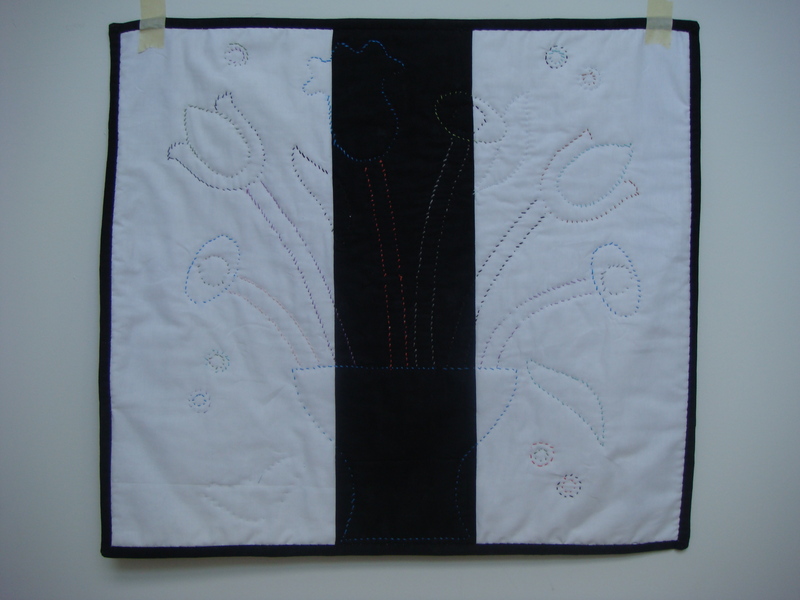 This entry was posted in Uncategorized and tagged applique, Hand quilting, Sarah Fielke. Bookmark the permalink. Great job, Sarah! I would never know its your first time appliquing. This is adorable! I love the little birdies. I’m sure I’ll be making the same mistakes when I do my butterflies – hahaha. Great finish! So cute but part of the problem you had in hand quilting is usually the quilting goes in the background beside the appliqué and so not as many layers to pull the needle and thread through. I do like the look of the stitching as you did it but it must have taken a long time and been very hard on your fingers… GOOD JOB!! Nice job. I have done a few hand-quilting projects and I always just do my hand work through the top and the batting. I baste the top and the batting together and put them in a hoop and do my hand work – then I back it and bind it. That way, the back of the work doesn’t show. You can also do some machine stitching after you add the back to keep all together. Just a thought if you don’t ever want to see the back of your stitches. Having said all of that – I always like the wonkiness of the back of the hand work. I think it shows the handmade-ness ( i know, not a real word) of the project. But really nice job. I really like your applique. I think that is a great attitude! Sometimes we are too afraid to try. Once you get going you can always adapt or change a technique( I am always doing that). Half of the things I do now, I didn’t even know existed when I started, lol. The stitches look great, love the thread colors. I like that it shows on the back too. Fabulous! Congratulations love your applique and hand quilting. Sarah Fielke is an amazing teacher. I have taken her craftsy class and one of her workshop. This is gorgeous, Sarah! The back does not look bad to me at all. Congratulations on learning needle-turn–that is on “my list.” I learned to hand quilt from this tutorial: http://www.sewmamasew.com/2010/05/learn-how-to-hand-quilt/ and I used to hand-quilt all of my quilts. I find that I can make many more quilts if I just do them on the machine, so I finally gave in, but it really used to be my favorite part of making a quilt. 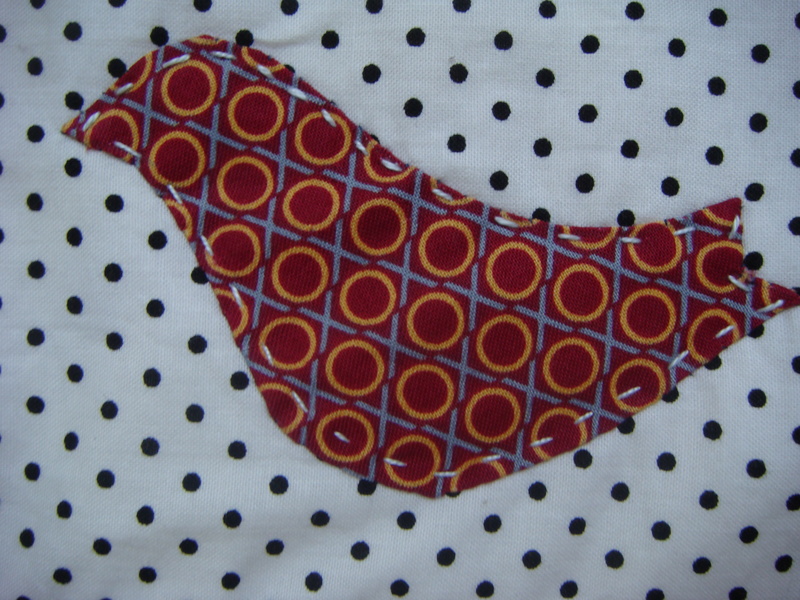 What a great first applique block! The more you do it, the better it will look on the back – the front looks great already. I like that look with the thicker perle cotton. 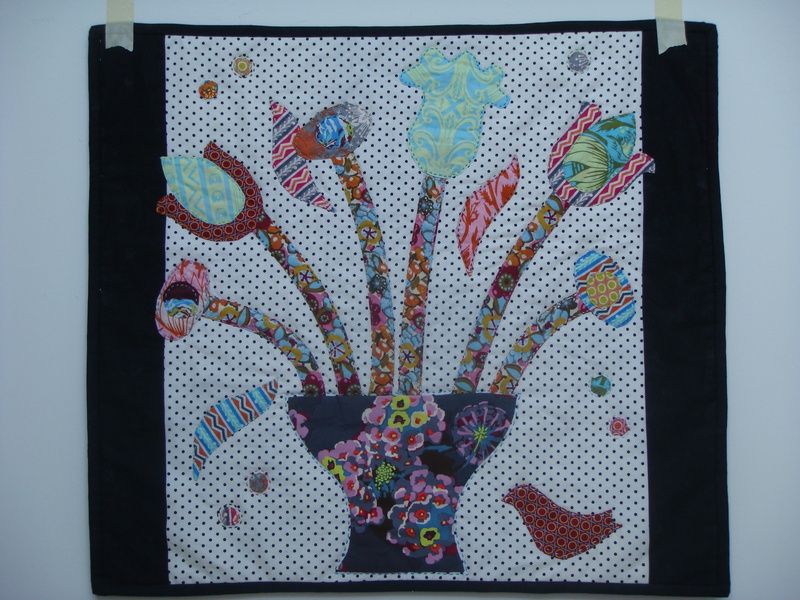 And thanks for linking up to Applique Tuesday! I’ll be back Monday to see that shirt idea. That is a really fun piece. I love the polka dot background. I too have just embarked on some hand-quilting (just a tiny doll’s quilt to start me off!). I couldn’t to grips with the quilting stitch either and so have just done the in-and-out method, resulting in a rather messy back which is disappointing. It’s not helped by the fact that I used quite a pale, plain fabric as backing which shows every wonky stitch! In future I will use a more colourful, patterned backing and will try and persevere with the proper quoting stitch! I am a coder and I’ve just thought of a cutting edge dating website page. it a shot. Do you need to sign up? We’ll pay you.